Washington State Patrol responded to a one-car, two-semi-truck collision on eastbound I-90 near Sunset Hill in Spokane this morning, according to KREM. Injuries were reported at the scene. State Patrol troopers are at the scene, and drivers should expect delays. The estimated time for reopening is unknown. Do You Need a Semi-Truck Attorney? If you've been involved in a semi-truck collision, the odds are already against you. Crashes involving semi trucks — also known as tractor trailers, big rigs, 18-wheelers, etc. — almost always cause serious injuries or death to those in small vehicles. And because trucking companies have aggressive defense lawyers standing by after an accident, your fight for medical bills, lost wages and pain and suffering will be a difficult one. For those reasons, you may need a lawyer on your side. Trucking companies often send investigators to the scene of the accident just hours after it occurred, and these aggressive tactics in the early stages mean they have the upper hand. The quicker you or a family member contacts an experienced trucking accident attorney, the better your odds of receiving the most compensation possible. Evidence such as skid marks and property damage fade or disappear over time, and your attorney will know exactly what to do. 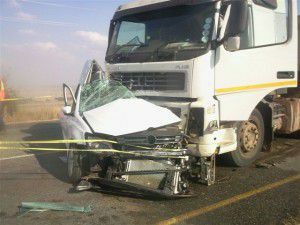 Handling a personal injury case arising out of a semi-truck accident is usually more difficult and complicated than dealing with other types of car accident cases. Don't let a trucking company and its insurance carrier get the upper hand. Their best interests are not aligned with yours. The less money the trucking company's insurance pays you, the more money goes in their own pockets. Don't be fooled when the insurance company offers to pay for your medical bills or initial lost wages — these offers are often designed to trick victims into forfeiting future compensation. Level the playing field. As soon as you or a family member is seriously injured or killed in an accident involving a semi truck, contact a trucking accident attorney who specializes in truck accident litigation to investigate your case and give you the advice you need to safeguard you and your family's best interests. 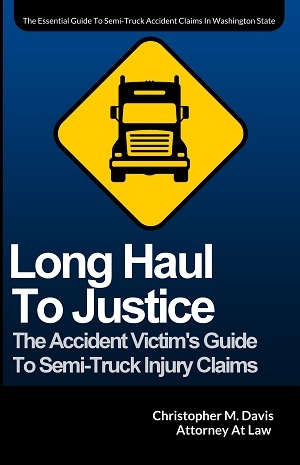 Contact attorney Chris Davis — the premiere semi-truck accident lawyer in Washington state — to get started on your case. Call (206) 727-4000 today. We recovered a settlement of more than $2 million for a young man who suffered serious injuries after being involved in a serious collision with a semi truck on Interstate 5 in Seattle.